FOXBOROUGH, Mass. – Something just wasn’t right with Revolution midfielder/forward Juan Agudelo over the last two months. But the reason why wasn’t entirely clear until earlier this week. After starting each of the team’s first 14 games, Agudelo’s playing time took a noticeable dip as the summer rolled around. Some wondered whether the 22-year-old striker was struggling to adapt to his role as a wide midfielder. But it turns out the situation was a lot more complex than that. Although his name never appeared on the injury report, Agudelo told NESoccerToday.com on Wednesday that he suffered a knock during his early-June U.S. Mean’s National Team call-up, and has been fighting to get back to full fitness ever since. In the wake of the injury, Agudelo only made three starts, and was largely unable to make the kind of impact seen earlier this season. Before long, a revitalized Diego Fagundez had taken over on the left side of the midfield, leaving some to wonder whether physical forward was truly cut out to be a winger. But Revolution coach Jay Heaps knew that it was just a matter of time before one of his top attacking threats would be back to full form. 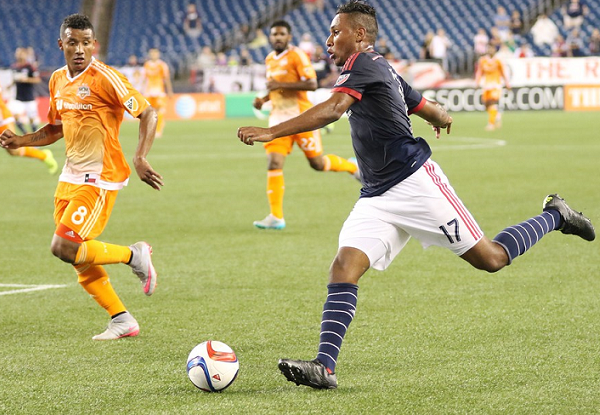 One sign that the Agudelo of old could already be back came in Saturday’s 2-0 win over the Dynamo. Coming off the bench in the 59th minute, the midfielder/forward helped secure the victory by scoring late after making a well-timed run into the area and pounding a Lee Nguyen pass out of the reach of Houston goalkeeper Tyler Deric in the 88th minute. The timing of the goal wasn’t by accident, either. After he and his teammates were given the previous weekend off thanks to a long-awaited bye week, Agudelo returned to training in the days leading up to the showdown against the Dynamo in top form.